Do you want to know the full range of your sound system's capability? Would you like to give some impressive demonstrations to your friends? Here is my collection of sound pictures which I took from a variety of familiar real life events. They illustrate the wide amplitude range of sound, from soft and soothing to loud and scary. They encompass the full audio frequency spectrum, from the airwave of a door closing to the ripping of a thin piece of paper. These sound pictures are educational, fun and enjoyable! Designing a loudspeaker involves much listening. Though I have accumulated a certain amount of experience and know what to look for in measured data, and how it relates to what I hear, there remains always the final listening evaluation. I listen to a large variety of commercial recordings, but there is the unknown factor of what processing, equalization, compression, leveling, etc. has been applied to the microphone signal, and what microphone setup, how many microphones, and what type and make have been used. Read, for example, Bob Katz's book on Mastering Audio to appreciate the many judgments that go into making a commercial recording. I have made my own recordings of sound events using a simple, head geometry related microphone technique. Thus, I am able to compare what I hear over my speakers to the sound picture in my memory while it is still fresh. It is a valuable tool in learning to listen analytically. The tracks on this CD are examples of the material that I use. Technically speaking, the recording device was a Sony TCD-D3 Digital Audio Tape Walkman for most of the tracks. You can see it and its additional battery pack in photo B. Track 12 was recorded through my own preamplifier into the Line Input of a Philips CDR 950 Audio CD Recorder. The same unit was also used to transfer all my DAT recordings to CD-RW using its built-in 48 kHz to 44.1 kHz sample rate converter. Tracks 15, 16 and 17 were recorded by Don Barringer on a Sony Pro-DAT machine and transferred to CD with an HHB CDR830 CD Recorder. 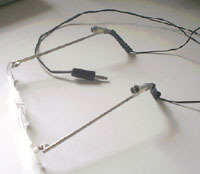 The three stereo microphones above are built with omni-directional capsules. 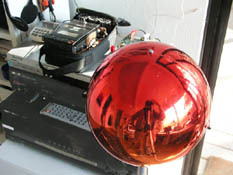 A sphere or a human head between the left and right microphones provides sound blockage, diffraction and delay to imbed directional cues into the sound pickup in a manner that is related to the head-related-transfer-function (HRTF) description. The resulting recordings contain cues for presenting a very smooth, non-lumpy spatial continuum. That is easy to check as you turn your head. The stereo separation is not as strong as with other microphone setups and tends towards mono. Therefore it is important to listen to these recordings no further away, when you measure the distance from each tweeter to your ears, than the distance between the two tweeters of your loudspeaker setup. I usually move even a foot closer than that. Rather than to describe the content of each track in detail, I prefer to let you experience the sounds for yourself and not bias you with what you are supposed to hear. Thus, I only comment on some recording venue and setup details and give indications of the playback volume level. The volume level setting in dB on my Lexicon DC2 preamplifier is provided as a relative reference. It is what I use with my ORION system and what gets me close to realistic levels. It may be too loud for some other sound system to handle. Be careful with your playback level the first time through the tracks. Also, my AT6012 power amplifier has fast acting overload protection, should I try to exceed what the system can handle. Your system may not have this safety factor. Note that for an accurate sound system the volume control acts subjectively as a distance-from-the-source control. So do not bring the source closer than it was in reality. Some tracks are very low level, even live. The tracks provide unusual yet familiar material to evaluate loudspeaker accuracy. In particular, the mp3 encoded versions of tracks 18, 22, 26, 30 and 34 not only allow you to evaluate the effectiveness of the encoding for different program materials, but they also serve to illustrate the resolution capability of your playback system and hearing. Lossy mp3 encoding distorts the time waveform, the frequency spectrum and stereo image depth. Listen not only over loudspeakers, where the room adds masking, yet imaging is best perceived, but also listen over headphones. They generally reveal other forms of distortion more readily. A Toneburst CD, which is also available, allows you to investigate masking contribution of your listening room, particularly at low frequencies. 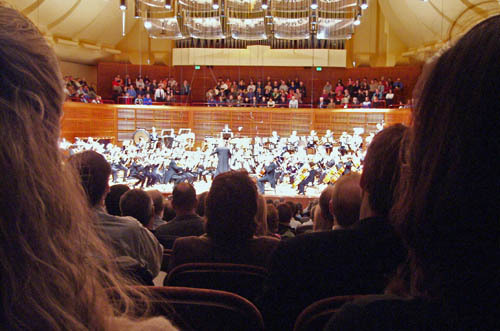 A large concert hall. Seated 25 rows back from the stage. Large orchestra tuning for Shostakovich Symphony #10. From 3rd row. Looking up to the underside of the piano lid. Very wide dynamic range. Measured over 105 dB SPL. Walking from the hall through a narrow, low ceiling door passage into the large foyer and out to the street. All in a large group of people. Continued walk to parking garage, up the stairs to the parking level and to my car. Inside the car and driving off. Door slams with large very low frequency content. SFO '95. - 6 dB and low cut filter. SFO '96. -6 dB and low cut filter. All instruments through loudspeakers and the vocalist uses stage monitors. 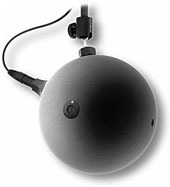 Sphere microphone B and additional Panasonic capsule omni for the voice. Outdoors in backyard about 60 cm from sphere microphone. On a calm early morning to avoid wind noise. 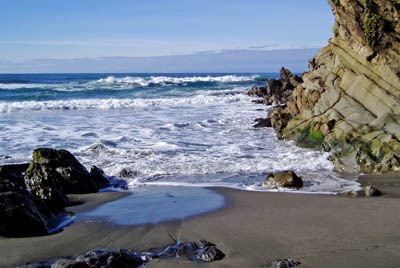 Other end of same beach, same time. Passing diesel engine train from same location as Track 15. Door slam with large very low frequency content. Lincoln '93. -3 dB and low-cut filter. Large room with open hallway.